Welcome to Our Church . . . Witamy! 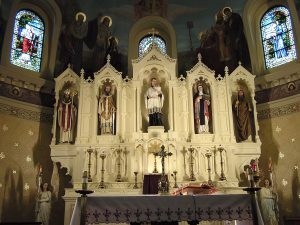 The Church of St. Stanislaus Kostka has represented the spiritual heart of Rochester’s Polish American community since its dedication in 1909. This majestic structure is the second church of the parish formed in 1890 by Rochester’s first Polish Catholic immigrants. Ground for the church was broken in 1907 and its foundation was completed before winter with the assistance of men of the parish, who helped excavate the site with hand shovels. When the new church was completed, it became a sign of the immigrants’ faith and the vitality of their community, as well as the most striking landmark of the city’s Polish Town. 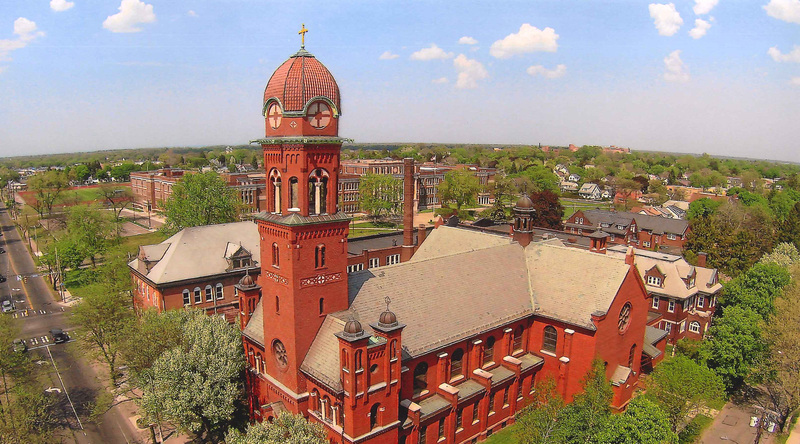 Designed in the Romanesque Revival style by the architectural firm of Gordon and Madden, St. Stanislaus has an exterior of red pressed brick with Medina stone base and white stone trim. The exterior features many graceful details including arched openings, columns, decorative brick, and inventive gargoyles. A distinctive domed steeple that is reminiscent of church spires in Eastern Europe rises 120 feet above the front entrance. Center: St. Stanislaus Kostka, 16th century Jesuit and patron of our parish. Left of St. Stanislaus: St. Wojciech, tenth century Bishop of Prague who preached the Gospel in Polish territories. Right of St. Stanislaus: St. Jadwiga of Silesia, a noblewoman who aided the poor and established the first Cistercian convent in Trzebnica. Wings of the altar: St. Cyril (monk) and St. Methodius (bishop), brothers who brought the Gospel to Eastern Europe, Russia, and Ukraine. King Mieczyslaw I, King of Poland, who converted his kingdom to Christianity in 966. King Boleslaw I (11th century), who extended the influence of Christianity in Poland. St. Jan Sarkander, 17th century Jesuit and martyr. St. Ladislaus, 11th century King of Hungary. Blessed Vincent Kadlubek, 13th century Bishop of Krakow. St. Kunegunda, 13th century benefactor of the poor whose shrine is in Stary Sacz. St. Jan Kanty, 15th century professor of theology at the University of Krakow. St. Jadwiga of Silesia, 13th century benefactor of the poor. St. Stanislaus Szczepanowski, 11th century Bishop of Krakow and martyr. St. Wojciech, 10th century missionary martyred by Prussians in Gdansk. St. Stanislaus Kostka, patron of our parish. St. Kazimierz Jagiellonczyk (15th century), greatly revered in Poland and Lithuania. Blessed Ladislaus of Gielnow, 15th century Franciscan poet and preacher. Blessed Jolanta (13th century), remembered for ministry to the poor. Blessed Bronislawa, 13th century mystic. The Faithfulness of Poland: This knight represents the enduring faith of the Polish people. The beautiful dome of the nave ceiling presents the “dome of heaven,” a traditional motif found in early Christian churches. The dome features a vivid blue sky highlighted with stars of gold and silver leaf. It was restored in 2003 by Henry Swiatek during our Church Restoration Campaign. Icons of the Four Evangelists (situated precisely north, south, east, and west on the ceiling) are joined by a cross radiating from the Lamb of God and incorporating the Tree of Life. The mural symbolizes the Church’s mission to spread the Gospel to the four corners of the world. For Poles and people of Polish descent, no image is more beloved than the icon of Our Lady of Czestochowa. This shrine honoring “the Black Madonna” was dedicated on November 16, 2008, to celebrate the centennial of St. Stanislaus Church. Here, we draw closer to Our Lady, encouraged by the example of Pope John Paul II who throughout his life expressed deep love for her. 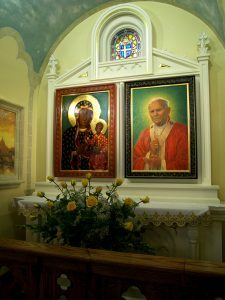 The icon of Our Lady, a replica of the original in Czestochowa, was created by Anna Maria Torwirt of Torun, Poland.The portrait of Pope John Paul II was painted by artist Cameron Smith of Wilmington, NC. Two landscape paintings, also by Cameron Smith, depict the church in Wadowice where Karol Wojtyla was baptized and St. Peter’s Basilica in Rome. Pope John Paul II’s coat of arms is presented in a stained glass window designed by Pike Studios of Rochester. The altar, prayer railing, and book stand were carved by John H. Bailey of Lima, NY. Parishioner Sandra Bialaszewski painted the frames of the icon and portrait, the walls of the shrine, and the star-filled sky. On the north aisle, you will see . . . The windows in the clerestory (upper level) depict angels holding scrolls inscribed with the Eight Beatitudes in Polish. Altar of the Blessed Mother. Statues of St. Anne (mother of Mary), and St. Joseph (Mary’s spouse). Mission Cross, dating from 1915. Statue of St. Peter (high on the transept wall), flanked by crests of the Polish Union of America and the Polish Roman Catholic Union. Stained glass windows of the Ascension and of Jesus receiving the children. A rose window with symbols of Christ. Altar of the Sacred Heart of Jesus. Statue of St. Anthony of Padua. Shrine of St. Francis of Assisi. Statue of St. Paul (high on the transept wall), flanked by crests of the Polish National Alliance and the Polish Falcons of America. Stained glass windows of the Nativity and of Christ in the Temple. A rose window with symbols of Our Lady. During his career, Nincheri created or oversaw production of more than 5,000 stained glass windows, frescoes, paintings, sculptures, and decorative pieces. His work was commissioned for an estimated 200 buildings, the majority in Canada and New England. In our church, Nincheri created murals of the Annunciation (side altar, north) and the Sacred Heart appearing to St. Margaret Mary (side altar, south). These murals covered two earlier murals on the same subjects created by Joseph Mazur in 1924. 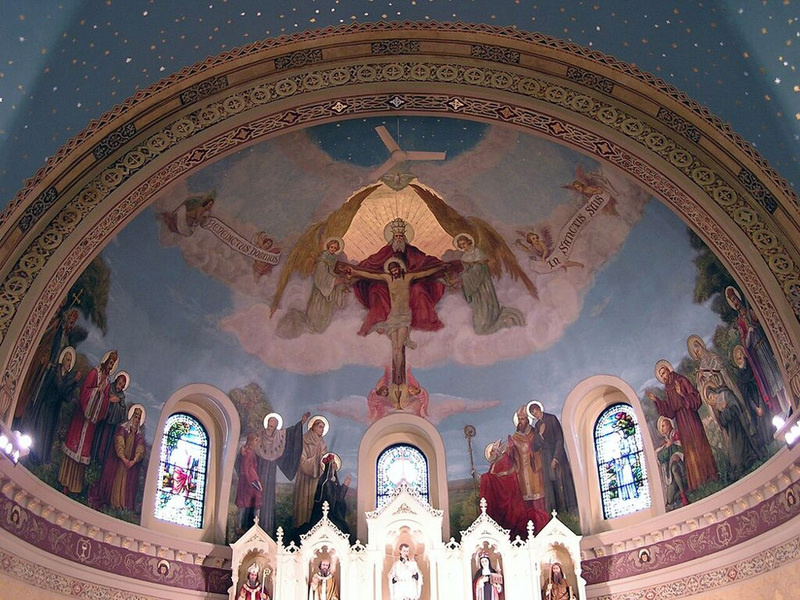 On the base of the choir loft is a fresco mural created by Joseph Mazur, with an inscription in Polish – a line from the Litany of Our Lady placing the parish and its people under Mary’s protection. This mural was covered over with white paint in the 1970s, lost from view for 30 years. It was uncovered with gentle scraping – almost completely intact — and retouched by Henry Swiatek in 2001. This quiet corner of our church offers a place to recall the poignant stories of two St. Stanislaus parishioners. 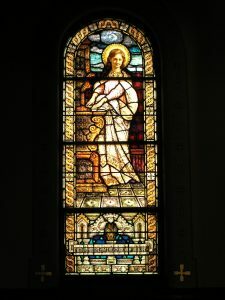 The window of St. Cecilia, patron of musicians, is a memorial to Emily Dukat, a promising violinist who died of influenza in 1920 at age 16. Her parents, owners of a bakery on Hudson Avenue, donated the window in her honor. The lovely facial features and wistful smile of St. Cecilia in this window belong to Emily, whose photograph was sent to Innsbruck where the saint’s face was created in her likeness. 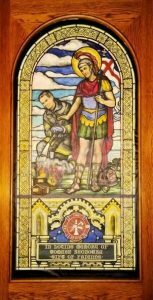 The window of St. Florian, patron of firefighters, is a memorial to Tomasz Kaczowka, who passed away along with his mentor and friend, Lt. Michael Chiapperini, while responding to a fire in Webster on December 24, 2012. Touched by the sacrifice of this young man who was only 19 years old, the parish commissioned the window, made possible through the generosity of parishioners, family, and friends. It was created by Pike Stained Glass Studios. In the window we see St. Florian, who was a Roman soldier, looking down on a raging fire and with a gentle hand quelling the flames. Although in many renderings St. Florian is shown assisted by an angel, in this window it is a young man in firefighter’s gear – with Tomasz’s features – who pours water on the flames.